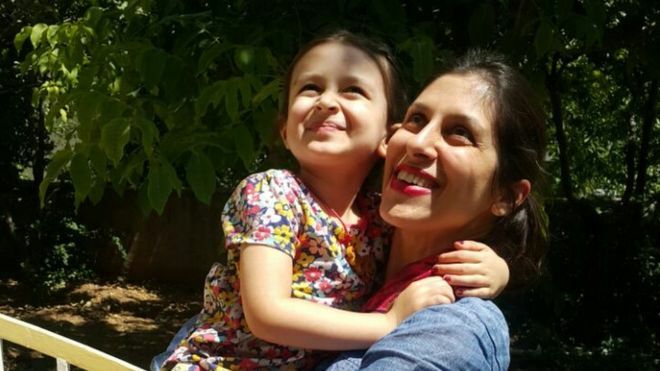 Iran has rejected the recent announcement by the UK government to grant British diplomatic protection to Nazanin Zaghari-Ratcliffe, who is in jail in Iran. Furthermore, they have refused to acknowledge the British citizenship of the British-Iranian dual citizen and a jailed mother who has been apart from her child for three years now. Her case has become a formal dispute between two countries, her husband told Zamaneh. On Saturday, Tehran’s prosecutor-general Abbas Jafari Dolatabadi asked Britain not to interfere in Iran’s internal affairs. Nazanin Zaghari-Ratcliffe has been in jail in Iran since 3 April 2016. Iran has not recognized the dual citizenship status in Nazanin’s case. This also applies to other dual citizens who have been arrested or convicted. 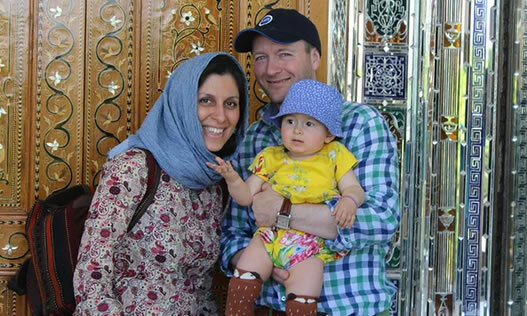 Richard Ratcliffe, Nazanin’s husband, told Zamaneh that he is still formally awaiting the response from Iran to the UK’s decision to grant Nazanin diplomatic protection. “Unless resolved soon, her case is now a formal dispute between the UK and Iran. In connection with this, we can ask the UK to carry out various escalations.” Richard Ratcliffe added. The next escalation could likely be to approach the UN, through lobbying with other families who are going through similar experiences. Iran has arrested foreign and dual nationals over the last four decades. In a recent report from Javaid Rehman, the UN special rapporteur for human rights in Iran, Tehran’s ongoing detention of foreign and dual nationals has been identified as a problem. Nazanin Zaghari-Ratcliffe has been accused of plotting against the Islamic Republic of Iran. She has denied all charges against her. She was arrested three years ago when attempting to return from Iran to the UK after a family visit. She has been separated from Gabriella, her four-year-old daughter. During her time in jail, her young daughter has not been allowed to leave Iran to return to her father in the UK. In January 2019 Nazanin went on a three-day hunger strike to protest against being denied medical care in prison. “Nazanin has still received no treatment since her hunger strike two months ago. Continuing complaints – her neurological problems in her neck, arms and legs, lumps in her breasts, and her mental health – all remain a concern.” Richard Ratcliffe said to Zamaneh. “Last week she was taken for an assessment by the Health Commission, which assesses what treatment is recommended, and whether the person in question is considered well enough to be in prison. The commission reiterated that she needs to have further scans and tests before a judgment can be made. Previously these have been blocked.” He added. In the latest reaction from Iranian officials to the granting of diplomatic protection by the UK to Nazanin, the Tehran prosecutor called on Britain not to interfere in her case. “Nazanin Zaghari has been sentenced in Iran, and the British government must not interfere in Iran’s internal affairs.” Abbas Jafari Dolatabadi said to the MehrNews agency. “Obviously, I think the call for the UK not to interfere is ironic from Iran, since it wants both to have its cake and eat it. The IRGC and MOI are targeting people for their foreign affiliations and connections, and then Iranian officials claim Iran doesn’t recognize dual nationality – when it is precisely because Nazanin is a British dual national that she was arrested. The only reason for arresting a mom and a baby on holiday was precisely to be provocative to the UK” said Richard Ratcliffe. The foreign secretary, Jeremy Hunt, asserted before that granting diplomatic protection might not lead to her immediate release. “It’s not a magic wand, it’s not going to solve things overnight, but it does create a different legal and political context and it sends a very strong message to Iran: you are a great civilization, you may have disagreements with the UK, but at the heart of this is an innocent woman, vulnerable, unwell and scared, and she has a four-year-old daughter.” Jeremy Hunt said. Nazanin Zaghari-Ratcliffe, who worked for the Thomson Reuters Foundation was sentenced to five years imprisonment in 2016.